Dec. 12, 2012: This week, NASA's Goldstone radar is tracking a large asteroid as it passes by Earth, and obtaining unusually clear images of the tumbling space rock. "There is no danger of a collision with Earth," says Lance Benner of NASA's Near Earth Object Program. 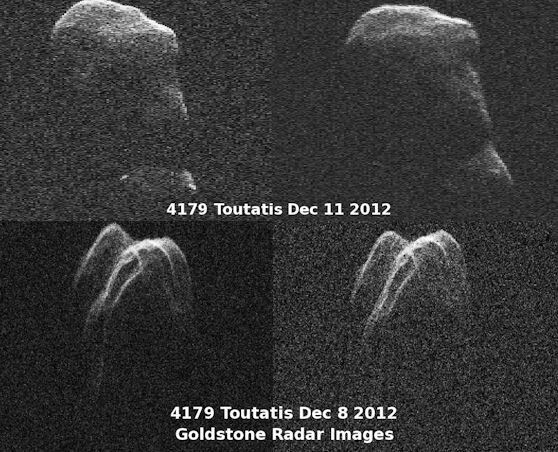 "At closest approach on Dec. 12th, asteroid 4179 Toutatis will be 7 million km away or 18 times farther than the Moon." Asteroid Toutatis is well known to astronomers; it passes by Earth’s orbit every 4 years. Measuring 4.5 km in length, it is one of the largest known potentially hazardous asteroids (PHAs), and its orbit is inclined less than half-a-degree from Earth's. No other kilometer-sized PHA moves around the Sun in an orbit so nearly coplanar with our own. This makes it an important target for radar studies. 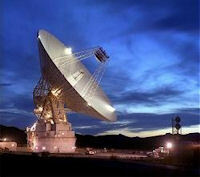 NASA's Goldstone radar in the Mojave Desert will be pinging the space rock every day from Dec. 4th through 22nd. The echoes highlight the asteroid's topography and improve the precision with which researchers know the asteroid's orbit. "We already know that Toutatis will not hit Earth for hundreds of years," says Benner. "These new observations will allow us to predict the asteroid's trajectory even farther into the future." Benner and colleagues are particularly excited about a new digital imaging system at Goldstone that could reveal never-before-seen details on the asteroid's surface. "Using the new system, we can now image the asteroid's surface with 2 to 5 times finer resolution than previous flybys," he says. "We may we see something new on Toutatis." The asteroid is already remarkable for the way that it spins. Unlike planets and the vast majority of asteroids, which rotate in an orderly fashion around a single axis, Toutatis travels through space tumbling like a badly thrown football (movie). One of the goals of the radar observations is to learn more about the asteroid’s peculiar spin state and how it changes in response to tidal forces from the Sun and Earth. It's probably no coincidence that the tumbling asteroid is elongated and lumpy. "Toutatis appears to have a complicated internal structure," says radar team member Michael Busch of the National Radio Astronomy Observatory. "Our radar measurements are consistent with the asteroid's little lobe being ~15% denser than the big lobe; and they indicate 20% to 30% over-dense cores inside the two lobes." This raises the interesting possibility that asteroid Toutatis is actually a mash up of smaller space rocks. "Toutatis could be re-accumulated debris from an asteroid-asteroid collision in the main belt," he says. The new observations will help test this idea. Busch points out that the upgraded Goldstone imaging system will produce data with a resolution of 3.75 meters per pixel. "We'll be putting hundreds of thousands of pixels across the asteroid's surface." What will so much resolution reveal? Stay tuned for updates from Science@NASA.